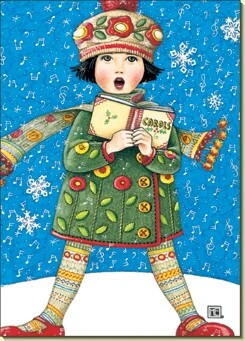 Sisters in Zion, Freshaire Designs: Here we go a Caroling! In our neighborhood there is a group of college aged young men who share a house. They all belong to a local Christian church. When they first moved into the neighborhood they went door to door introducing themselves to all their new neighbors. In addition, they gave us their numbers along with a list of combined skill sets they were willing to share, if there was ever a need. Handyman work, yard work, and car repair were all on the list. Both my husband and I were impressed at their genuine kindness. Come to find out, these young men spend their Friday nights with other young men and women studying the Bible. Last Christmas, as they gathered together, they filled a wagon with hot chocolate, marshmallows, and Styrofoam cups. Bundled up, they walked the neighborhood - guitar and snare drum (yet, a drum) in tow - offering up hot chocolate and Christmas carols to all who would open their doors. I know our family loved the music, appreciated the gesture and enjoyed the unexpected surprise. Here's a simple formula to follow as you go door to door: First of all, keep it brief. Three song maximum. Start with a fun song. Follow with a song that shares the true spirit of Christmas. And end with the classic, "We Wish You A Merry Christmas".